So, your start-up had some difficulties raising money from venture capital funds and you think now it is time to gain access to a broader group of potential investors. Hiring a finder is a great way to tap into a larger investor-base since a finder already has a relationship with many investors. But using a finder comes with several additional legal concerns. Before you hire a finder, be sure to discuss the following issues with your legal counsel. Should your finder register as a broker? Compensating the finder based on the outcome or size of the transaction (a “success fee”) rather than compensating the finder for services regardless of outcome. Soliciting investors by actively promoting the stock (and not merely opening up its address book). Negotiating the terms that apply to the security your start-up company is offering for sale. Executing the transaction by drafting or distributing sales or financial materials. Handling the securities or funds of investors in connection with the securities transaction. Frequently effecting or facilitating securities transactions. 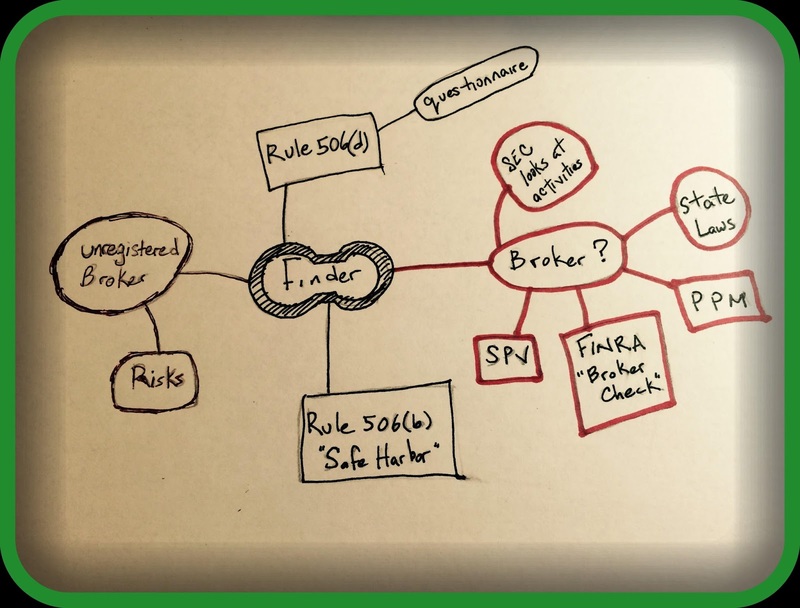 The SEC may determine that a finder is a broker if any of these factors apply to the finder’s fundraising efforts. Additionally, applicable state securities laws may define “broker” differently and may impose additional requirements. If your start-up company engages an unregistered broker to sell securities, investors may have a “rescission right” – meaning investors may recover their investment from your start-up company – and your start-up company may be barred from relying on Rule 506 of Regulation D for future exempt securities offerings. The broker may also be barred from collecting its finder’s fee, subject to cease and desist orders from the SEC, and be subject to civil or criminal penalties. Can a finder impact the securities exemption you plan to use for the financing round? Yes! As we discussed here, Rule 506(b) of Regulation D provides issuers, such as start-up companies, with a safe harbor under the private placement exemption of the federal securities laws. Generally, Rule 506(b) permits an issuer to sell securities to an unlimited number of accredited investors (and up to 35 non-accredited investors) if the issuer does not engage in general solicitation or advertising and provides required information to non-accredited investors. Additionally, the SEC forbids companies from relying on Rule 506(b) if the issuer or certain other interested parties, including any finders that will be paid (directly or indirectly) for soliciting investors, are “bad actors.” In Rule 506(d), the SEC lists several acts that will result in a “bad actor” determination. Several of the acts listed under Rule 506(d) may apply to finders, such as an order by the SEC entered pursuant to sections 15(b) or 15B(c) of the Securities Exchange Act of 1934 (which apply to brokers) that (1) suspends or revokes such person’s registration as a broker, (2) places limitation on the activities, functions or operations of the broker or (3) bars such person from participating in the offering of any penny stock. If any of the acts listed under Rule 506(d) apply to the issuer or one of the interested parties, to proceed with the transaction the bad actor will have to obtain a waiver from the SEC. If a waiver is not obtained by the bad actor, the issuer may not rely on the exemption until the issuer or related party is no longer a bad actor. As we mentioned in our discussion of Rule 506(b), many issuers will undertake due diligence efforts to ensure that the issuer and its officers, directors and large stockholders are not bad actors. Most issuers fulfill this obligation by sending out a brief Rule 506(d) questionnaire. When an issuer engages a finder, the issuer may want to enhance its due diligence efforts with respect to the finder by also reviewing the websites of the applicable SRO or state securities agency for any violations. FINRA’s BrokerCheck provides a full report about each broker that is registered with it, including most relevant legal violations. It is important to search each entity and individual who will be involved in offering securities offering for bad actor violations. What kind of information should the finder provide to investors? Since the investors identified by a finder may not be familiar with you or your start-up company, it is important to provide a detailed description of your start-up company in a private placement memorandum. Generally, this document will contain a detailed description of the company’s history, business plans, financial statements, potential risks to the company and investors (or “risk factors”), use of proceeds from the financing, a description of the securities and the manner of sale. Sometimes the finder will create a special purpose vehicle (“SPV”) that will invest directly in your start-up company and the finder will sell interests in the SPV to its investors. Before agreeing to this structure, you should talk to your legal counsel regarding additional disclosure regarding the SPV. The securities laws require that the private placement memorandum, or any other written materials or presentations, do not contain any false or misleading statement of materials facts or contain any omissions of material facts. You should have your legal counsel review all offering materials before they are sent to investors. Are there any other business or legal concerns? During the closing process, a registered broker will have to complete certain documentation for compliance with their SRO’s requirements. This administrative process must be completed properly and may delay closing the transaction if the documentation is not properly completed by the broker’s staff. Raising money with a finder also provides a different business opportunity than raising money from a venture capital fund. For example, following a fundraising transaction, venture capital funds will often appoint a director to your start-up company’s board of directors. A director can advise you as your start-up company executes on its business plan. Additionally, venture capital funds can introduce business opportunities and provide resources that you could not otherwise access. In comparison, once a finder completes fundraising, your start-up company will have a larger, more widely dispersed stockholder-base. Since the investment amounts from each investor are relatively small, the investors may not be similarly motivated to counsel your start-up company. Selling securities with a finder has many advantages, chiefly access to new sources of capital, but prior to hiring a finder it is important to consider the additional legal and business constraints that apply to this type of fundraising.